LG's new flagship phone has good performance, fine camera tech and an interesting way to add new components. But do these add up to a top-notch device? Despite being available around the world for many weeks already, LG's G5 has finally been announced in Australia. This is actually an improvement as some of its predecessors arrived so late as to be End of Life (globally) when they got here. But is it worth the wait? And how does it fare in a market with a still-impressive iPhone, Samsung S7, Nexus 6P and imminent HTC 10? All you folks who miss having a replaceable battery in your high-end smartphone, your ride is here. 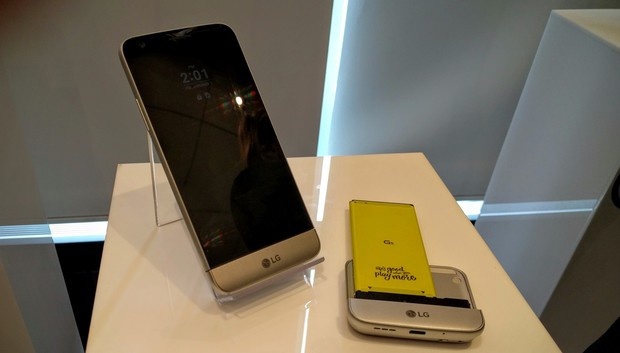 LG's new flagship, the LG G5, has as its signature feature a slide-out replaceable battery. It's not the only interesting thing about the phone, but it's the most obvious - and LG's decision to zag when the entire rest of the world is zigging will get most of the attention. The question is: Does the phone as a whole rate as a high-end device? Batteries that could be swapped out by customers have been an endangered species since the first iPhone came out, and last year's Samsung Galaxy 6 was the last top-end phone to join the party. Over the years, phone battery life has steadily improved, although generally not reaching a full day under more than moderate use -- and what constitutes "moderate" has been a subject of some discussion. Even the phones that did have replaceable batteries didn't do a stellar job of it. The Motorola Droid famously required its users to pry the entire plastic back off the phone, not a job for the faint-hearted. And phones that had replaceable batteries had to use custom batteries and chargers, adding to design cost and customer expense. Inconvenient as external chargers may be, they are at least cheap and universal. 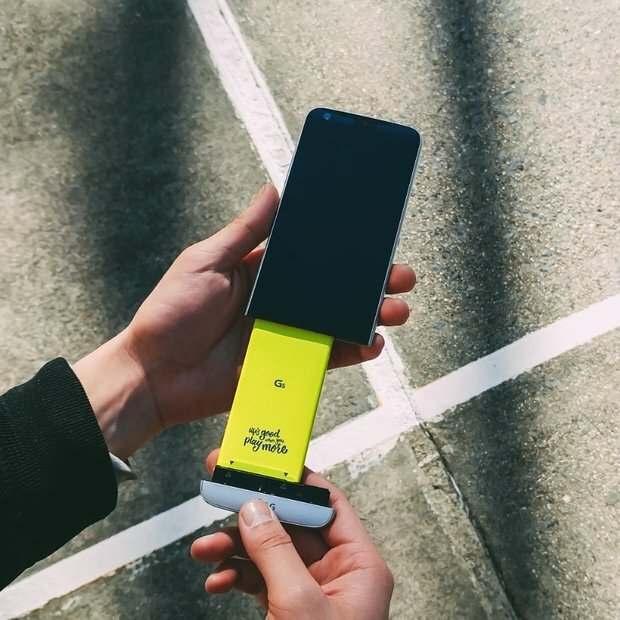 A small button near the bottom of the phone's left edge pops off the phone's chin, to which the slim 2800mAh battery is attached, and the assembly slides out. For all of that, LG did a pretty good job engineering the battery on the G5. A small button near the bottom of the phone's left edge pops off the phone's chin (in other words, the small bottom section), to which the slim 2800mAh battery is attached, and the assembly slides out. I was able to snap the spent battery off the chin and a new battery on quickly and easily with just a little practice. And after all that, you may not need to swap under most conditions; battery rundown tests show a 4-hour talk time for the LG (the same as the Galaxy S7), so you should be set for the day. It's a little freaky to hold a phone that, with the battery removed, appears to be mostly empty. However, the G5's metal construction is rugged enough to not feel fragile, even with such a significant part of the phone's innards yanked out. It is, however, a dramatic illustration of just how much of a phone's guts is devoted solely to powering the thing. With such a handy feature as a removable lower section, LG's engineers quite reasonably looked for other things to do with it. One interesting add-on is the $129 Cam Plus, a replacement chin that works as a handle to control the phone's camera. The Cam Plus adds a shutter button and a scroll wheel that controls the camera's zoom function. The Cam Plus is a replacement chin that works as a handle to control the phone's camera. It's an interesting notion that doesn't quite come together. When I tried it, I found that the handle didn't add enough weight to allow me to balance the phone in one hand. When I held the phone in landscape mode, my thumb inevitably rested on the screen, and I wound up triggering controls that I didn't mean to trigger. The other accessory currently available is the Hi-Fi Plus with Bang & Olufsen Play. This is an add-on high-quality Digital-to-Analog Converter (DAC) from a luxury audio company. LG didn't make it available for review; a quick hands-on at the product's introduction last year was not all that impressive. A price for the Hi-Fi Plus wasn't available at press time. Despite the attention-grabbing battery, I found the G5 itself to be a letdown when compared to the Samsung Galaxy 7 line. The G5's screen measures 5.3-inches diagonally, slightly more than the Samsung's 5.1 in. Accordingly, the G5's overall dimensions are slightly larger than Samsung's at 5.9 x 2.9 x 0.3 in. (compared to the Samsung's 5.6 x 2.75 x 0.3 in.). The volume rocker is along the phone's left edge, the SIM/micro-SD drawer along the right edge, and the power switch/fingerprint sensor is in the middle of the back of the phone, just below the two main cameras. (More about that later.) The G5 weighs 5.6 oz. ; as comparison, the Galaxy 7 weighs 5.3 oz. It's all driven by a Qualcomm Snapdragon 820 quad-core chip, 4GB of onboard RAM, 32GB of storage and a micro-SD drawer with a theoretical limit of 2TB. (Of course, you can't buy a commercial micro-SD card anywhere near that capacity yet, but if you could...) Processing power and speed are commensurate with the Galaxy. The phone is driven by Android 6.0.1 (Marshmallow). Bluetooth, Wi-Fi and NFC radios are all as expected. Charging (and USB connectivity) is with a single USB-C port. Other phones - the Nexus 5X and 6P from Google and Huawei's interesting Honor 5X - share the G5's placement of the fingerprint sensor on the back of the phone, but the G5 also uses it as a power switch; it feels like a good and natural idea for everyday use. It's not necessarily the greatest if you're using the phone during some physical activities where you can only touch the phone and not grab it, but classic Android PIN or pattern unlocking is always available. Build quality and ergonomics are not quite up to the level of other high-end smartphones. When I picked up the phone and unlocked it with a fingerprint, my thumb fell above the volume rocker, which was awkward. Also, presumably as a consequence of the removable battery, there's a thin metal bead -- I'm guessing it's the antenna - around the circumference of the phone's back. It helps you grip the phone, but detracts from the smoothness of the curve. The G5's IPS screen carries 2,560 x 1,140 pixels at a density of 554ppi. I found LG's screen to be good enough, but it suffers by side-by-side comparison with, say, Samsung's Super AMOLED screen with a density of 640ppi. This is a technology problem: OLED screens are sharper and have a deeper black than IPS screens. They just look better. Most phones now come with two cameras: one front facing and one back facing. The G5 has three: one front facing and two back facing. One of the back cameras is a garden-variety 16-megapixel f/1.8 device. The other is an 8-megapixel wide-angle camera (135-degree capture) with an aperture of f/2.4, which provides a much wider field of capture but fewer pixels and poorer low-light performance. There are a few neat hacks to this arrangement. If you zoom in while using the wide-angle camera, the G5 automatically switches to the higher resolution normal camera. You can fire two or all three cameras at once in a variety of split-screen layouts; this lets you take a selfie and a picture of what you're reacting to - in wide-angle and regular angle - all at the same time. And, if you like, you can take a quick shot while the phone's otherwise asleep by pressing the Volume Down button twice rapidly. Every premium vendor has its own idea of how Android should look and work. LG has decided to do away with the App Drawer. On the G5, there is no place to stash all your apps; they all appear on the top level, as they do in iOS. You can group them into folders, but they otherwise show up on an endless series of swipe-able screens. To the left of the home screen is what LG calls Smart Bulletins: updates from LG Health (a fitness app), your calendar, a music player, location and context-sensitive sets of system settings, Glympse and Evernote. There are other choices. The Settings menu is tabbed into four categories - Networks, Sound & Notification, Display and General - which goes a long way to surfacing Android's lengthy list of options. Also, LG lets you customize the universal Back, Home and Menu buttons (which on the G5 are on the display) to account for handed-ness or personal preference. No-contract pricing of the G5 is $1,099 and it will be available from Optus and Harvey Norman on 2 May and Telstra 3 May. This is roughly what you'd expect to pay for a top-tier phone. Various contract pricings will also be available, depending on the carrier. If reviewing a phone were a simple matter of setting up a matrix of features and checking off which phones have which, the LG G5 would be in the top tier of phones. It's got the right processor, innovative cameras and software, and an industry-unique battery. If any of those - particularly the battery - is a must-have for you, the G5 could be a good choice. But there's more to it than that. The G5 exists in a world of other phones, and it doesn't quite measure up to phones such as the Samsung Galaxy line. The screen's not nearly as good, the build quality falls short, and the lack of an App Drawer will bug a lot of people. And trading water resistance for a swappable battery is, to my mind, an unwise trade in the real world. If it were a couple of hundred dollars less, you could make a case for the LG G5. At this price, and with the quality of the competition, there are better choices out there.